This morning I participated in the installation of my and other artists’ works in the public spaces venue which our Three Rivers Artist Guild facilitates. What beautiful and interesting work these folks are producing! My Floating Blossom series (4) is now on view (October through December) at the Oregon City Community Development Office at 221 Molalla Avenue, Oregon City, Oregon–office space with bright sleek interiors. These four pieces are still available individually, but they run and rub well together so to be viewed as a bright contemporary landscape series. Find them on my website in the Flora Portfolio or in my Etsy shop (Etsy because they are small in both size and price). Leaving our installation time, I went for pastry, and the bakery had art on all of its walls, jewelry on the counter, and it was a visual delight to be surrounded by local creators of all ages and working in different genres, while I purchased a treat! Keep your eyes open for seeing the creative spirit anywhere, and know someone’s distant relative poured her heart into that piece! 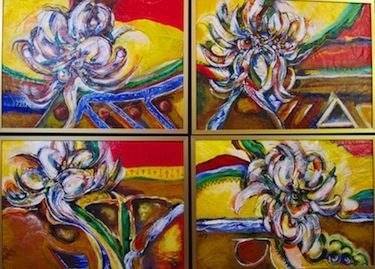 Recently a collector returned to my site, www.CherilynSunRidge.com, to augment her previous purchase of a single 6×6. She chose two additional works to create a stellar vertical display, putting “Grapefruit by Candlelight,” top (she wants a gallery tag next to it for the title alone! ); “Desert Breath,” bottom (in which her eye sees a Buddhist vajra); to compliment her initial purchase of “Spring Maple Pod,” center (which is her/my/our freedom in the wind piece!). Thank you for loving the creative spirit wherever you see it! My inner ways are circles and spirals and arcs. Recently while in my studio, I was asking the powers that be to help me with something in my mindset. I was engaged in staring and pondering and also painting. My asking for this assistance was real and truthful and authentically uttered because I thought its answer would solve a problem. I took a break, sat under a tree, gazed high through glorious branches. The answer came with great clarity, and surprisingly was not blatantly related to my precise question. I was informed to paint “Sacred Hoops.” I was filled with glee and joy and satisfaction. Much of my work uses circles and spheres because that is often how I see what I am looking at. To be charged with a defined theme was like a wish come true! The piece here, “TransReceiver” is one of my new Sacred Hoops. My Acupuncturist/Reflexologist friend ooo’ed at it and said it looks like acupuncture needles. That is fitting, because it certainly is about connections, and so is the healing art of acupuncture!